When traveling abroad I often find myself in a bit of a predicament. How do I go about taking a picture of a city’s iconic landmark, in a way that’s different from the myriads of other pictures taken before me? To me, this is all about creativity and the ability to play around with composition. I find that there is no recipe for success, other than just work the scene, find a unique perspective and just simply experiment. The rules of composition i.e. patterns, leading lines, rule of thirds can be your friends, but breaking these rules might sometimes help as well. Silhouettes, reflections, framing with trees, the possibilities are endless. Here is my attempt from my trip to Paris two weeks ago. 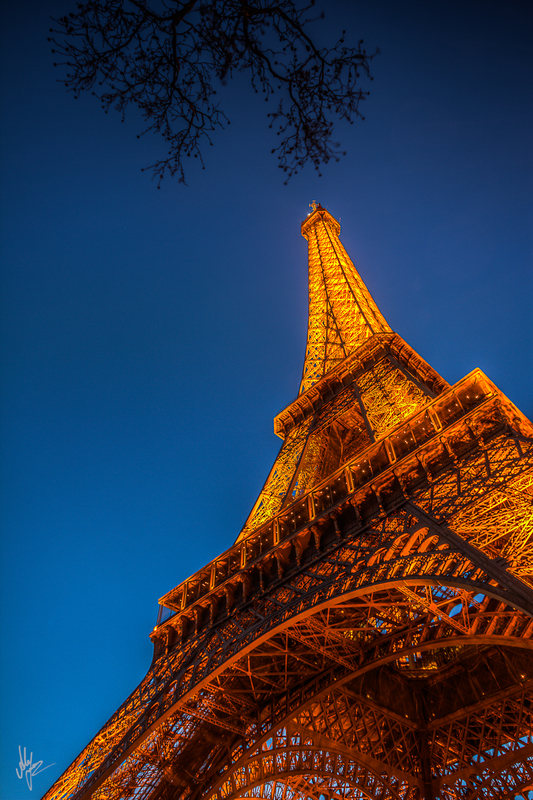 I arrived at the Eiffel Tower right before sunset and stayed for a short time until the twilight hour. I’ve managed to capture two decent shots, one of which is the below. I will be posting my second shot in a couple of weeks. It’s not as unique as I was hoping for, but given the short window of opportunity I had, I am pretty happy with the results. Shot with my tripod mounted Canon 60D and my Sigma 10-20mm F4-5.6 DC HSM lens, at ISO 100, F8, at 3.2 secs (exposed at -2/0/+2).